Dr. Jemini Paul completed her M.B.B.S. from Christian Medical College, Ludhiana, Punjab, India in 1974 and D.G.O (Diploma in Gynaecology and Obstetrics) from same institution in 1978. She then completed her Doctor of Medicine (MD in Obstetrics and Gynaecology) in 1982. Dr. Jemini has an Excellent work record in field of Obstetrics and Gynaecology for almost 38 years. She has extensive experiences in the field of antenatal care, normal and abnormal deliveries, postnatal care and gynecological surgeries. 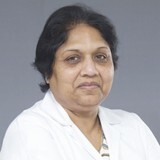 She has worked as an Obstetrician and Gynaecologist in various hospitals of international repute like ALFALAJ Hospital, KSA and TMM Hospital, Thiruvella, Kerala, India amongst others.